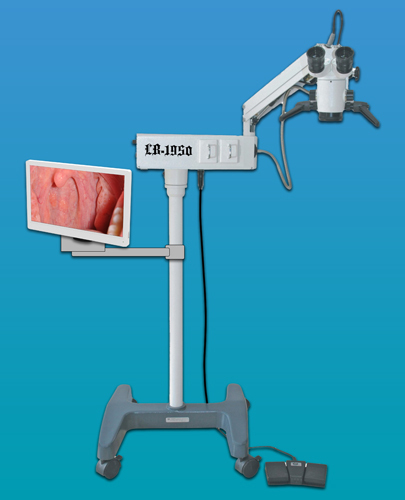 LB-1950 Operational Microscope for Dental, ENT and Ophthalmology (Cataracts and Other Eye Surgeries) is a friendly to use coaxial illumination operation microscope for one person. It is portable and compact. It is suitable for carrying out cataracts and other eye surgeries. All the lenses are multi-coated, mildewproof and anti-reflective. Desktop stand can be chosen to make the device more portable. It can also be customized according to various operation requirements. Foot control focus, 3 gears magnification, sharp images and comfortable observation, can meet the needs of cataracts and other eye surgeries. With apochromatic technology, focal points of different wavelengths light through the lens are very close, the operators’ vision is more clearly. Can use CCD Camera, CCD Adapter, Beam Splitter by optional. It is portable, compact and is mainly applied in clinic, hospitals and mobile hospitals for Dental, Ophthalmology, ENT and areas like these. Used for continuous adjustment of illumination intensity. Be used to switch on or switch off power supply. In case the working bulb burnt during an operation, the spare lamp module may be inserted so as to ensure the operation to be continued smoothly. This nut lets microscope suspend on the small horizontal arm. Though there is protective melt, you must check this nut tightened or not. Fix the revolving angle of the suspended spindle of microscope. Lock the microscope and make it not revolve at up and down plane. Adjust ocular diopter by rotating this ring. The range of adjustment is ±6D. Adjust exit-pupil distance. Its height is 18mm and it may be taken off or rolled down. For rough focusing, move the microscope up and down or right and left. Three magnification steps are provided. With different objectives the magnification factor of each step differs. Rotating the knob to change the magnification. Fix the manipulating handle so that it will not loose. Avoid the microscope dropping when the fixing nut looses while unloading it or suspending it. Lead the light beam from bulbs to the operating position. Lock the little arm by tightening it firmly so as to prevent the microscope from moving up and down. Tighten it in order to lock the little arm and make the microscope not move vertically. Tighten it in order to lock the light source box to make it not revolve when moving or storing. 2. Table installation parts(holding stand, split column). 3. 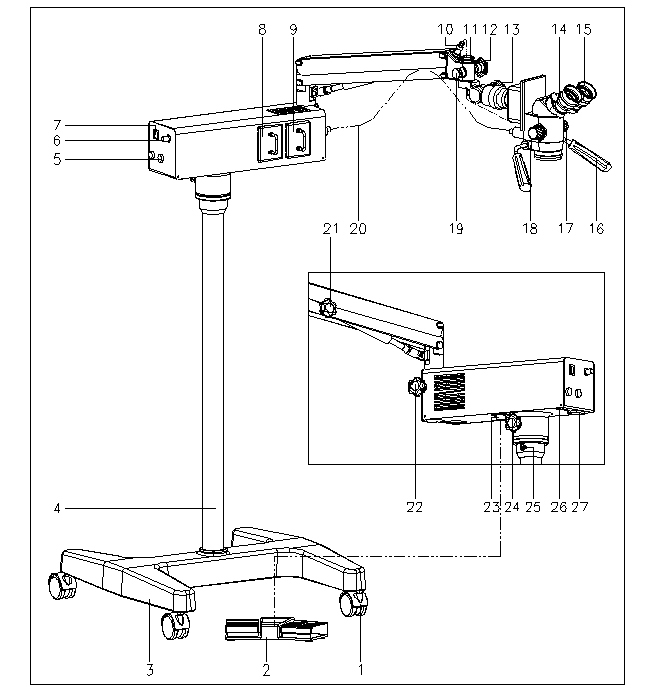 Video devices(1/2” or 1/4” CCD Camera, CCD Adapter, Beam Splitter and Connecting Cable). 4. Straight Binocular, Universal Joint(for ENT). 5. Portable packaging. Including three canvas bags and a luggage cart.